Well, that's a long title. 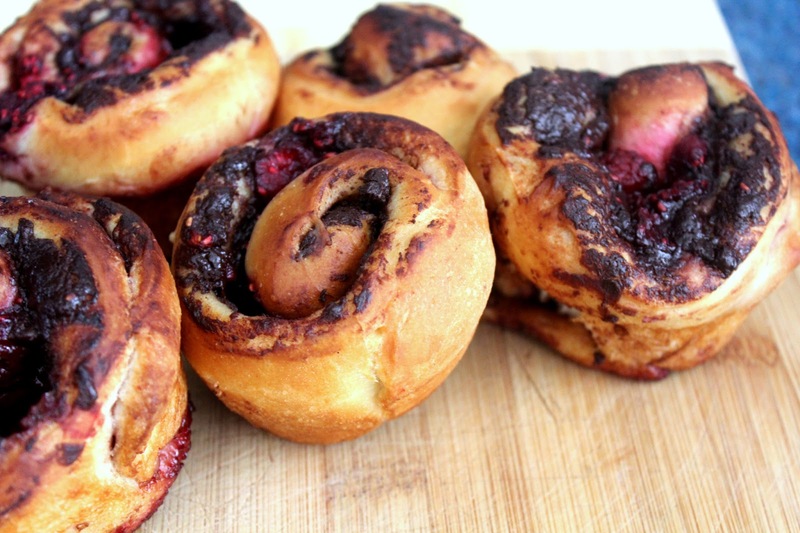 But it pretty much covers everything that is in these AH-MAZING sweet rolls. I'm sure you've all had cinnamon rolls before, right? Well these are like that, except not at all. These rolls are even better, I kid you not. Firstly, they are made of Challah bread; sweet, moist, soft, Jewish bread. If you've never had Challah, you're letting yourself down. Secondly, these don't have just cinnamon in, which is a bit of a strong flavour and often I find it overpowers dishes. 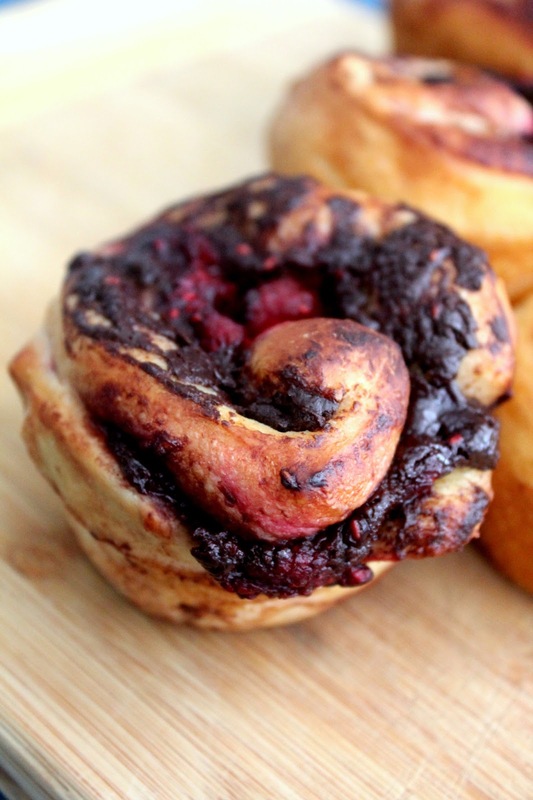 These have chocolate and raspberries in. 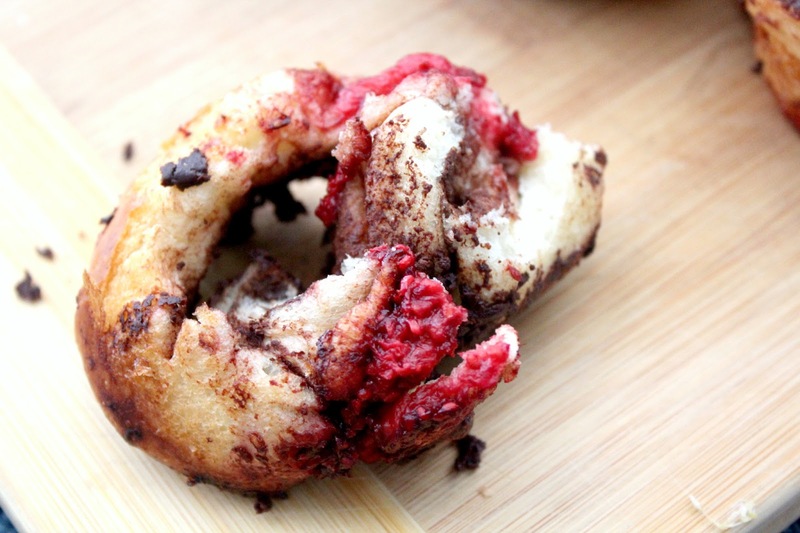 Chocolate and raspberries are a stellar combination, I am telling you. Thick, rich, dark chocolate mixed with tart, ripe raspberries, covered in super sweet cinnamon sugar? Inside Challah bread? Rolled up delicately so in each bite there is an absolutely amazing tang of chocolate and raspberry? Yeah, that's what makes these rolls so special. There are two parts to this recipe. The first involves making Challah bread from scratch. I do not have an original recipe for this. Instead I direct you to the ever brilliant Averie of Averie Cooks, whose Challah is delectable, light and best of all, not remotely time consuming. Now my advice is this: make her Challah bread dough. As she points out, it makes two Challah breads. Make one Challah bread when you first make the dough. Enjoy it warm, with some kind of butter. Love yourself for making something so amazing. Place the remaining dough in the fridge in a container, with the lid slightly popped open so the dough can breathe. 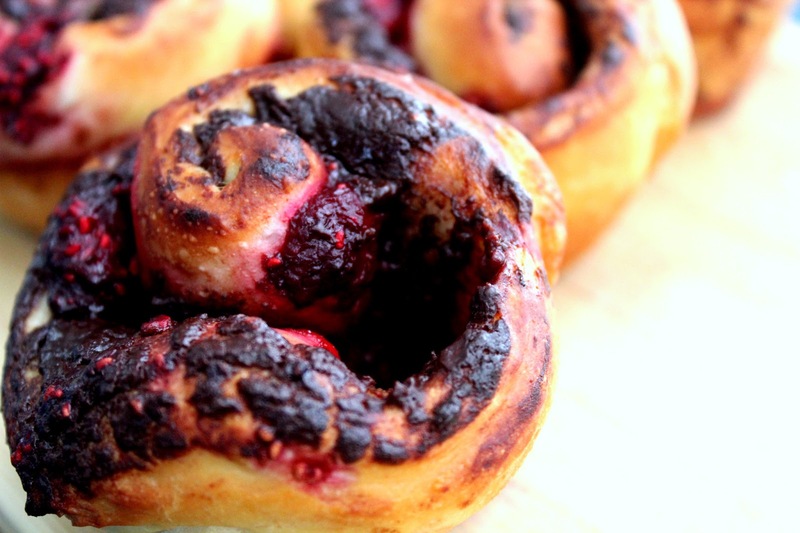 Within five days use the remaining dough to make these sweet rolls. Or you can use the whole dough from Averie's recipe. Just remember to double all the other ingredients I list - if you double the dough used, you must double the filling. Okay, now that we've sorted out the dough, let's move on to the good stuff. Side Note: I'm no longer going to be putting up calorie counts or nutrition stats for my recipes. If you want them, there are ways to determine them online. As I no longer place such a high importance on my caloric intake, I feel I do not have to justify whether my recipes are perfectly healthy or not. Hint: this one isn't. EDITED TO ADD: If you guys are looking for more amazing food, check out Buns in My Oven What's Cooking Wednesday Linkup. I entered these guys in. Level of difficulty: Not incredibly difficult, but you have to be patient when making the dough (as per Averie’s recipe) and you have to be careful when rolling and cutting the sweet rolls. You will make a mess. Menu Options: You can always change the fruit around in this. I’m sure strawberries, blueberries, blackberries and goji berries would all work. Other fruits may even work – mango or mango puree might work for this. Of course, depending on the size of the fruit you would need more or less fruit or else the recipe would get messy. You could always use milk chocolate, but I prefer dark chocolate with fruit. Preheat the oven to 180 degrees Celsius. Grease 9 muffin holes in a regular 12-muffin-hole tray. Place a large piece of baking paper on a bench. You want to do this as the filling of the sweet rolls is very runny and you will get your bench horribly messy if you don’t put the paper down. I’m warning you. First, make the chocolate ganache. On a stove over low heat, in a small saucepan, combine the chocolate and cream. Stir until the mixture is well combined and thick. Make sure there are no streaks of cream; it should be entirely chocolate. Take the saucepan off the heat and leave the ganache to cool. In a small bowl, combine the sugar and cinnamon well. The sugar should turn a dark cinnamon-y colour. Taste, and add more cinnamon if so desired. I would still ensure the sugar is the overwhelming taste, as you need the sweetness from the sugar for the sweet rolls. Place the cup of raspberries in the microwave and microwave for 30 secs. They should be soft, but not yet runny. Flour your hands and a rolling pin lightly. Roll out the Challah bread dough until it is flat. The dough will only be 1-2 cm in height. Make a rectangle shape with the dough, using a clean knife to cut off extra bits if necessary. Try to get the dough to roll out to be around 30 cm x 13 cm. This is merely approximate however, and you might be able to make a bigger or smaller rectangle. Over the base of the dough, layer the chocolate ganache. It will make the dough go soft if it is still hot, so make sure it has cooled slightly. 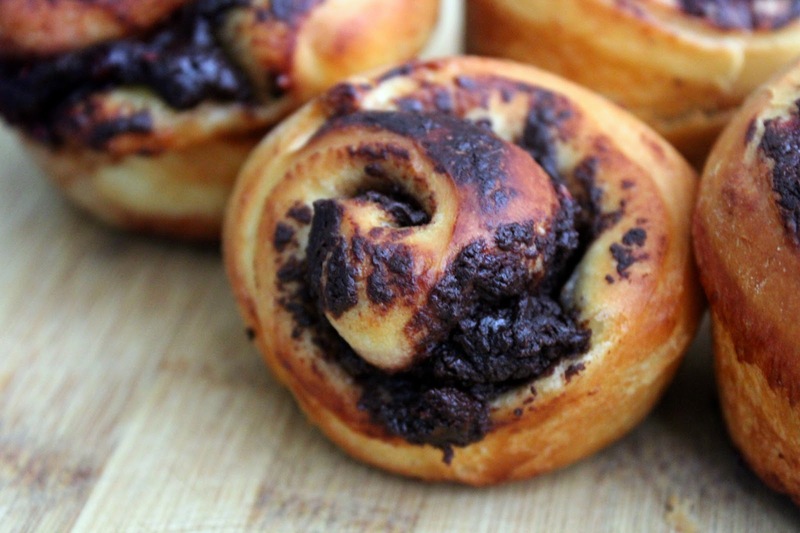 Make sure the chocolate covers the entire dough. Top the chocolate ganache with the raspberries, spreading them evenly over the chocolate. Spread the sugar over the top of the raspberries. It will dissolve into the chocolate-raspberry mixture. Do not worry about this. Keep spreading the sugar around evenly until you have used it all. Roll the dough up tightly. By this, I mean roll the long length of the dough to the other long length of the dough. This is very hard to do. You have to roll the dough evenly as you go. It will get messy. 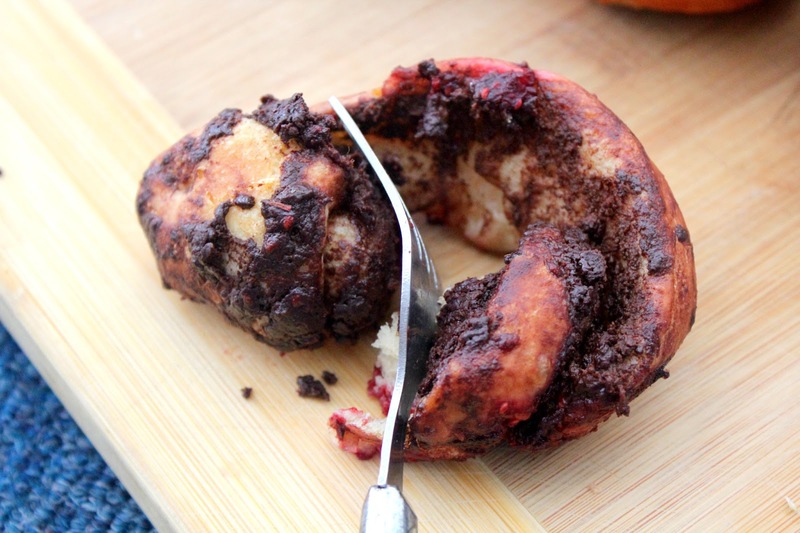 Using a clean knife, cut the rolled dough into nine even pieces and place each piece in a greased muffin hole. This is where it gets messy. 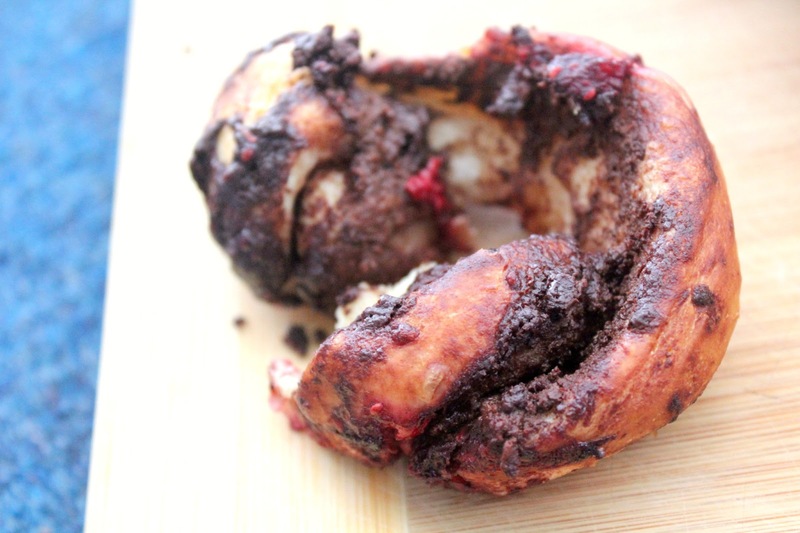 Let it be messy – the more chocolate and raspberries that leaks onto the dough, the more delicious it looks when cooked (even if it doesn’t look good pre-cooking). Trust me on this one. If you make more than nine, or less than nine, that is fine. Sometimes that happens with dough. Cover the entire muffin tray with a piece of plastic wrap and let the dough rise in a hot place for approximately 1 hr 20 minutes. This may depend on the heat of your kitchen or whether you are using fresh dough or refrigerated dough. Once the rolls are at the top of the muffin tray, place them in the oven. If they are not at the top by the time the 1.20 mark rolls around, put them in the oven anyway. They rise astonishingly fast in there. Place the sweet rolls in the oven for 10-15 minutes. Keep an eye on them. 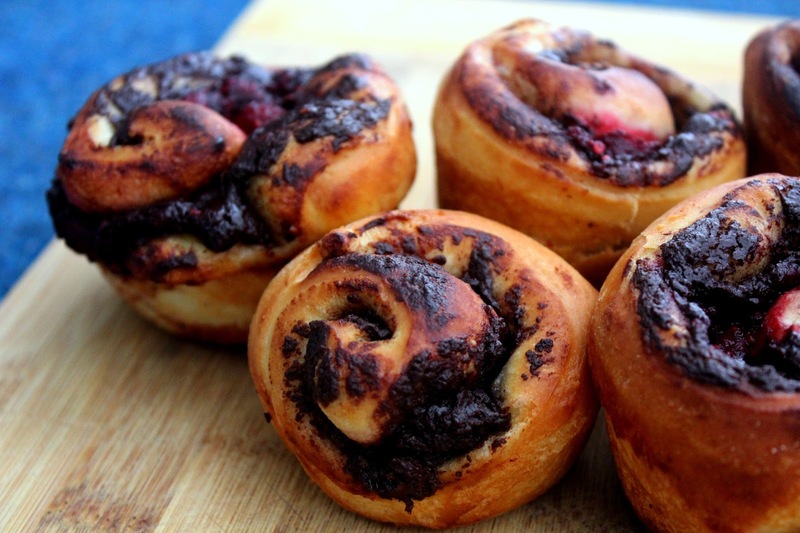 They not only rise fast, but you do not want to overcook the bread or burn the chocolate. If you are unsure of their progress, touch the dough. If it springs back slightly and is a golden brown, they are cooked. The chocolate might look black, but it will be okay. Serve warm. If you want, serve it with the drizzle from this recipe, for extra decadence. These look so tasty- great recipe! Thank you very much! That's lovely of you to say.